^ Witkowska-Banaszczak E. Bylka W. Matlawska I. Goslinska O. Muszynski Z. "Antimicrobial activity of Viola tricolor herb". Fitoterapia. 76(5):458-61, 2005 Jul. ^ Toiu A. Parvu AE. Oniga I. Tamas M."Evaluation of anti-inflammatory activity of alcoholic extract from Viola tricolor. ", Revista Medico-Chirurgicala a Societatii de Medici Si Naturalisti Din Iasi. 111(2):525-9, 2007 Apr-Jun. ^ Vukics V. Kery A. Guttman A. "Analysis of polar antioxidants in Heartsease (Viola tricolor L.) and Garden pansy (Viola x wittrockiana Gams.)". Journal of Chromatographic Science. 46(9):823-7, 2008 Oct.
^ Vukics V. Ringer T. Kery A. Bonn GK. Guttman.,"Analysis of heartsease (Viola tricolor L.) flavonoid glycosides by micro-liquid chromatography coupled to multistage mass spectrometry." A. Journal of Chromatography. A. 1206(1):11-20, 2008 Oct 3. ^ Vukics V. Toth BH. Ringer T. Ludanyi K. Kery A. Bonn GK. 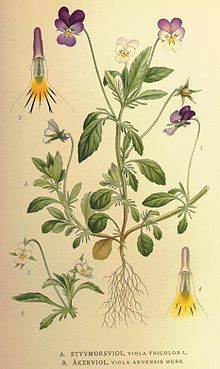 Guttman A.,"Quantitative and qualitative investigation of the main flavonoids in heartsease (Viola tricolor L.)". Journal of Chromatographic Science. 46(2):97-101, 2008 Feb.
^ Rimkiene S. Ragazinskiene O. Savickiene N. ,"The cumulation of Wild pansy (Viola tricolor L.) accessions: the possibility of species preservation and usage in medicine." Medicina (Kaunas) 39(4):411-6, 2003. ^ Toiu A. Muntean E. Oniga I. Vostinaru O. Tamas M. " Pharmacognostic research on Viola tricolor L. (Violaceae)." Revista Medico-Chirurgicala a Societatii de Medici Si Naturalisti Din Iasi. 113(1):264-7, 2009 Jan-Mar. ^ The other candidate is "Love-in-a-Mist" or Nigella, a common garden plant of Shakespeare's day, varying in colour from white through pinks to an almost true blue (suggested, e.g. by Dr Henry Bull, "Love in Idleness (Nigella)" in Transactions of the Woolhope Naturalists' Field Club 1883-85 (1890), pp 61ff.